Michelle (C-IAYT, e-RYT 500, LCSW) has more than 30 years experience in the field of health and wellness. She is passionate about utilizing the wisdom of therapeutic yoga to help others maximize their quality of life, health and wholeness. 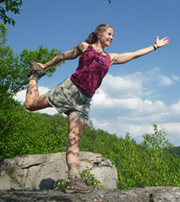 Michelle is a certified yoga therapist through the International Association of Yoga Therapists. She is also a registered yoga instructor with Yoga Alliance, and is a Certified Fitness Professional through AFAA and IDEA. She holds a certification in neuromuscular integrative massage from the Center for Human Integration and a master's in clinical social work from Catholic University of America. Michelle has enjoyed working with yoga therapy for 20 years; teaching individuals, couples, groups and other yoga teachers the benefits of therapeutic yoga. She is a voracious student of anatomy, and combines her in-depth knowledge with a variety of yoga traditions including Iyengar, Ashtanga, Anusara and Vini yoga to bring healing and enhance wellness on every level. Michelle enjoys meeting students in every stage of life and believes the practice holds benefits for everyone.